It’s hard to believe only ten years have passed since touch screen phone keyboards entered the mainstream, sweeping away the misery of millions who otherwise had to type messages with a number pad. Unfortunately for BlackBerry and its iconic QWERTY keyboard, the touch screen revolution also heralded its Ozymandian collapse, ending its dominant position among professionals; the KEY2, now available in the UK and Ireland, marks the Canadian company’s latest and most ambitious effort to rehabilitate the name. Not long ago, BlackBerry devices were issued to solicitors, barristers and judges as a matter of course. Hundreds of those who made their way in and out of the Irish courts this week will be former BlackBerry users. Thrust the KEY2 in their hands, however, and they may be in for a surprise — a great deal has changed in the past decade. Besides its physical keyboard, this powerful device has very little in common with the BlackBerry smartphones of the past. The KEY2 is powered by Android 8.1, boasts a high-resolution 4.5” multitouch display (which, at 433 pixels-per-inch, falls just shy of the pixel density on Apple’s flagship iPhone X) and a dual rear camera capable of taking 12-megapixel photos and filming 4K video. 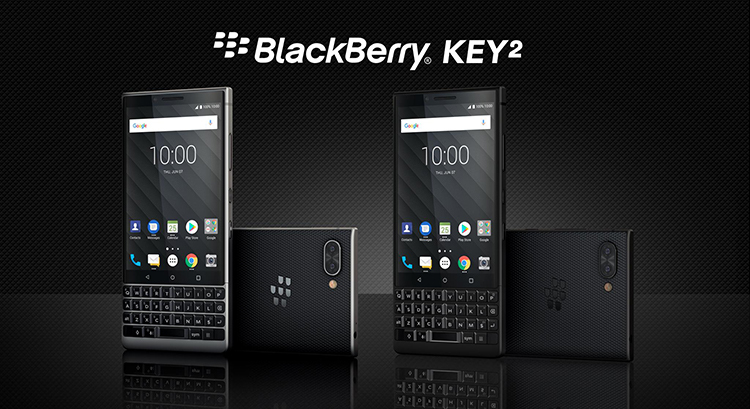 By consumer smartphone standards, the KEY2 checks many boxes. The metal case is solid and comfortable, with a good grip on the plastic rear; the performance is very snappy; and, crucially, the phone’s impressive 3500 mAh battery easily lasts two work days on a single charge (though you’ll have to chuck your old chargers — the KEY2 uses the new reversible USB-C cable). The DTEK by BlackBerry app provides a security assessment of installed apps, a boon for lawyers in the age of GDPR. It’s the physical keyboard, of course, that sets the KEY2 aside from other high-range smartphones. What was the millstone around BlackBerry’s neck ten years ago has now, in a market saturated with identical black slabs, become its unique selling point, marketed heavily towards lawyers and other professionals who are increasingly working outside their offices and most likely to benefit from working on lengthy documents without autocorrect mishaps. There’s certainly a learning curve, but with enough practice anyone should be able to type at lightning-speed. There’s also a lot more to the KEY2’s keyboard than meets the eye. First of all, the entire keyboard is touch-sensitive, functioning as a subtle replacement to the optical trackpad or trackball boasted by old-school BlackBerry devices. You can gently draw your thumb up and down over the keyboard to scroll leisurely through your Irish Legal News bulletin. Another useful gesture sees a sharp flick to the left delete the last word you typed. Secondly, the space bar doubles up as a fingerprint reader, allowing you to easily secure your device without suffering the constant inconvenience of typing in a passcode every time you pull it out of your pocket. There is some anecdotal evidence to suggest that the build quality of the KEY2 keyboard varies, with some online users reporting issues with the space bar becoming unresponsive. For a phone with a price tag starting at €649 (Ireland) or £579 (UK), this is particularly disappointing. There is also reason to worry that the KEY2 will never see a software upgrade to the latest Android 9 operating system, which was launched in August — BlackBerry’s other Android-powered devices have rarely received the major updates rolled out post-release to other high-end phones. This shouldn’t, by any means, rule out the KEY2 as an option. It’s an otherwise robust device, and it could be right for you depending on what you’re looking for from your smartphone. It’s not a small phone by any means, clocking in at 151mm by 72mm and nearly nine millimetres thick, and it’s on the heavier side too at 168 grams. If you’re selfie-obsessed, you’ll find the front-facing camera unimpressive; the rear-facing cameras, while decent, perform particularly poorly in low light. As a communications device, however, the physical keyboard is an outstanding feature and, if used right, a massive productivity boost. Having written tens of thousands of words on the device in my time with it, the keyboard certainly has this journalist’s ringing endorsement.